Webcam "Weather Webcam Adelboden (Bernese Oberland)"
In Adelboden, there is the Webcam Weather Adelboden (Bernese Oberland) with motif: Hahnenmoos-Pass. 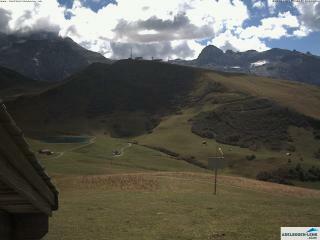 The webcam Adelboden is regularly updated with new pictures. Track the current weather in Adelboden Bernese Oberland with the webcam ADELBODEN. Weather Webcam Adelboden Hahnenmoos. Adelboden is located in the Bernese Oberland, at the end of Engstligentals, which flows in Frutigen into Kander. The Adelboden-Lenk-steering includes 56 lifts with more than 170 km of slopes for all levels. There are in Adelboden-Lenk 23 km cross-country trails, 74 km of winter hiking trails and a Kunsteiszentrum. The "Kuonisbergli» (Chuenisbärgli) is in Adelboden since 1956 one of the venues of the FIS Ski World Cup. Adelboden is a road leading to the tap Moss Pass. The road is passable only with special permit. Of the steering also a road leading to the pass, which turns in the final kilometers to a gravel road on which there is a driving ban. Hahn said the Moss Pass is generally obtained by foot or by cable car: From the side, the needle Boxenstrasse Hahnenmoospass from Geils Adelboden with a gondola reached. From the side of the Lenk-Metsch a chair lift which is operated only in the winter. From Hahnenmoospass one has views of the Wildstrubel, which is located within a few kilometers south. On the other side of the valley of the Hahnenmoos Pass lies the ski steering Betelberg. The current live Weather for Adelboden is provided by netatmo.